Families of the disappeared protest in Coahuila for the lack of results in investigations, impunity and law-making and implementation. Briefing note. First day of International Symposium on Enforced Disappearance in Mexico. Following the opening speech from Lourdes Herrera, Reinar Huhle, member of UN Committee against Enforced Disappearance mentioned in his keynote that enforced disappearances have become generalized phenomena. It is not only found in military dictatorships but also in democracies such as Colombia and Mexico. In the latter contexts, enforced disappearances become more complex given the involvement of both state and non-state actors. The second keynote speaker was Roberto Garretón. He is an expert on enforced disappearance from Chile. He discussed how the state is always involved in any human rights violation. In the case of enforced disappearance, this includes not only the direct intervention of state actors but also their negligence and distortion of information. He focused on the Chilean experience. According to Garretón, the work of human rights defenders should be the search for the truth through interdisciplinary research and the recording of all cases of disappearance. He also mentioned how Mexico has not received any solidarity from Chile and Argentina in this human security crisis, even though Mexico opened its doors to refugees during military dictatorships and supported those Chileans and Argentineans who were fighting against enforced disappearances in their countries. On February 9th, the United Forces for our Disappeared in Coahuila (FUUNDEC) held a meeting with members of the Independent Working Group on Forced Disappearances, and several state and federal authorities. State authorities included the Governor of the State of Coahuila, Lic. Rubén Ignacio Moreira Valdez, the Secretariat of Legal Affairs and Human Rights of the Secretary of the Interior (SEGOB), Lia Limón Garcia, the Human Rights Department of the Attorney General Office (PGR), Ricardo Garcia Cervantes, the State Coordinator for the Federal Police in Coahuila Commissioner, Eduardo Valiente Hernández, and the Congresswoman Miriam Cárdenas Cantu. 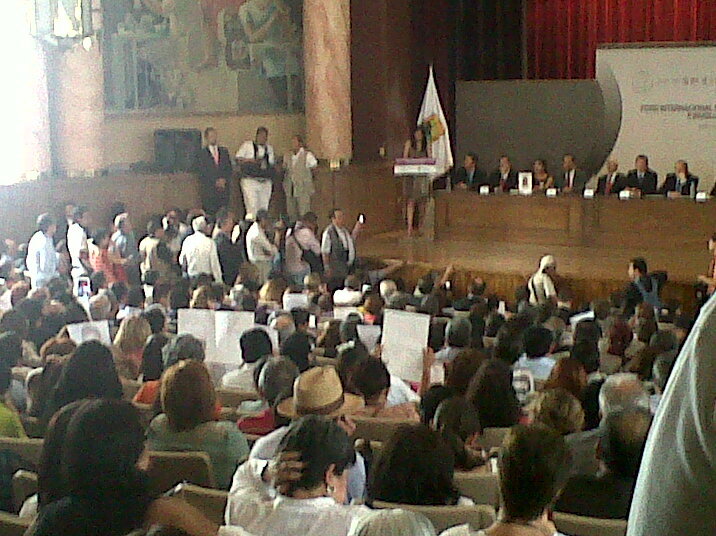 Three years ago we, who integrate the United Forces for our Disappeared in Coahuila, decided to speak out, organize ourselves and denounce the disappearance of our loved ones; we did this in a context where both authorities from the Institutionalized Revolutionary Party and the National Action party participated through collaboration and/or negligence in these crimes at the state and federal level. Both levels of government and both parties stained our homes with darkness, terror and impunity. A first group of 11 families, who at that time were looking for twenty one loved ones, gathered together on December 19, 2009. Currently, we are looking for 290 missing persons in December 2012. I am from Greece. I am a Fine Arts student and I’ve always had the illusion of knowing places outside Europe, other cultures and other landscapes. So I decided to ask for a scholarship to go to Mexico. I was pretty lucky and my dream was fulfilled. I got a scholarship in 2010 to study Fine Arts at UNAM! My joy was great! I had always wanted travel to Mexico, to know its ancestral culture, see its precious relics, art before and now, the beautiful landscapes I saw in pictures, and enjoy its famous cuisine. Friends who had already travelled before to Mexico returned with the best impressions and all were eager to return!